Spiders. How do you feel about them? If I wasn’t so creeped out by them I’d feel bad that they get such a bad wrap. I understand that they have their place in the world (or so I’m told) and I know they’re probably more freaked out by us than we are of them, but I wouldn’t be the least bit upset if I went through life never seeing another spider again. I mean, c’mon. Eight legs are a bit excessive, don’t you think? I probably shouldn’t admit that Mike and I regularly call for my mother-in-law to capture any rogue spiders to release into the wild aka a healthy 20 feet from the house. But there ya go. So this morning as I was preparing the blackberries that I had just picked from the garden, I nearly jumped out of my skin when I saw a giant, man-eating spider emerge from the bramble. I may or may not be embellishing on the man-eating part. I was half expecting it considering their were webs basically covering the bushes, but I’m not going to lie – it scared the sh** out of me. I suppose that is the price you pay for home grown, pesticide free food. Creepy crawlies considered, that’s a price I am willing to pay. Not only did the blackberries come from our garden, but so did the apple. Since the weather is starting to cool down a considerable amount effecting the blackberries and the apple tree is now in full bloom, the apple/blackberry combination was a no brainer. 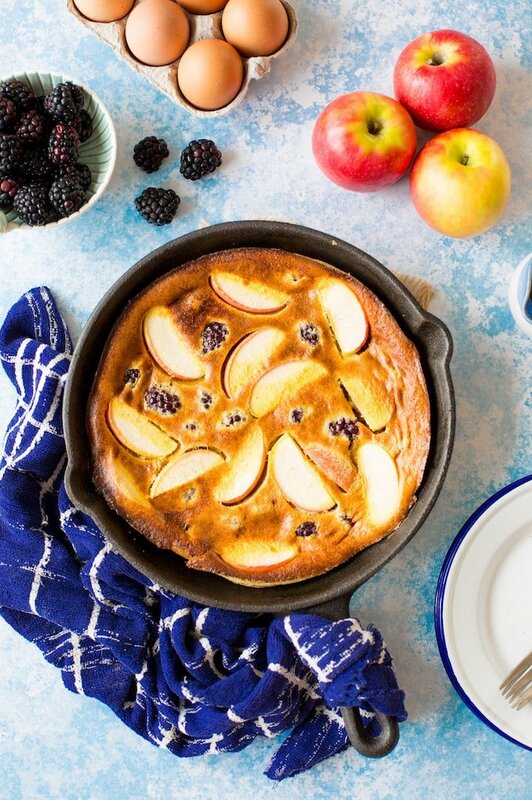 This blackberry & apple paleo dutch baby feels like the perfect early fall breakfast. I like dutch baby’s because they’re typically not too sweet and not too heavy. Earlier this year as I was trying to figure out how to make a traditional English gluten free toad in the hole for Mike, I realised that toad in the holes are basically savoury versions of dutch baby’s plus sausage. Since making that recipe I played around a bit more until I was able to make a grain free version which I can’t believe I never actually posted. I also really like how simple this recipe is – it’s great for those last minute I-don’t-know-what-to-cook meals that always comes out tasting and looking like a lot more effort went into it. A slice of this and a cup of coffee is the perfect way to enjoy a lazy morning with the family. Sorry for talking about spiders so much in this post – can we still be friends? 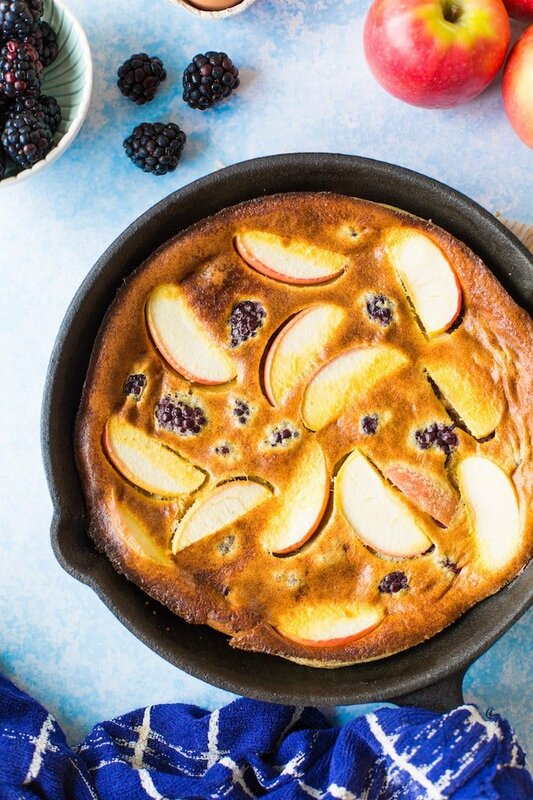 Don’t forget to #asaucykitchen on instagram if you try this Blackberry & Apple Paleo Dutch Baby We love seeing what you make! You can also post your pictures to my facebook page! While the oven is heating, mix your eggs, milk, vanilla, sugar, almond flour, tapioca flour, and cinnamon in a medium sized bowl. Whisk well - you can do this easily in the blender if you don't mind cleaning up one extra thing. Take the skillet out of the oven and add your oil to the skillet. It should be hot enough to melt the coconut oil quickly if it's solid. Swirl the oil around the skillet to coat the bottom and the sides, and then slowly pour the batter over the oil - careful not splash any hot oil on yourself. ce n’est pas gagner mais réaliser la recette. j’aimerai réaliser cette recette mais en france je ne trouve pas de farine de tapioca ni de farine d’amande peut ont remplacer par quoi ? I like the sound of your Saturday mornings! So glad you guys liked it – and thanks for sharing about the coconut flour! That’s really helpful to know! Thanks Rachel! My family is adjusting to my daughter’s newly discovered food sensitivities and while Paleo fits most of her dietary requirements, she also cannot have egg. Wondering if using chia or flax egg with some baking powder would be likely to work in this recipe, since this require so many eggs? Anyone have experience with it? Hi Sarah!! Happy, Healthy and Prosperous New Year to you!! I made this for my husband and I this morning as a special first breakfast of the 2018 New Year 🙂 My husband enjoys eating dutch baby pancakes so I googled Paleo and found your recipe. It came out beautiful and delicious!! It was easy to prepare, as you said…I used my food processor and ground roasted, salted cashews in place of almond flour and used 1 tablespoon of honey in place of coconut sugar. I followed the rest of the recipe as is. I used fresh blueberries, raspberries and diced apple in the batter. I baked it in an 440 degree over (my oven runs a bit hot) in a cast iron pan. It was golden on the crust and top, the texture was great, and there was no coconut flavor…just delight in every bite!! My husband loved it and did not know how healthy it truly is. Thank you for a GREAT recipe and I will certainly make it again! Hi Dorinda! That makes me so happy to hear – thank you so much for sharing! 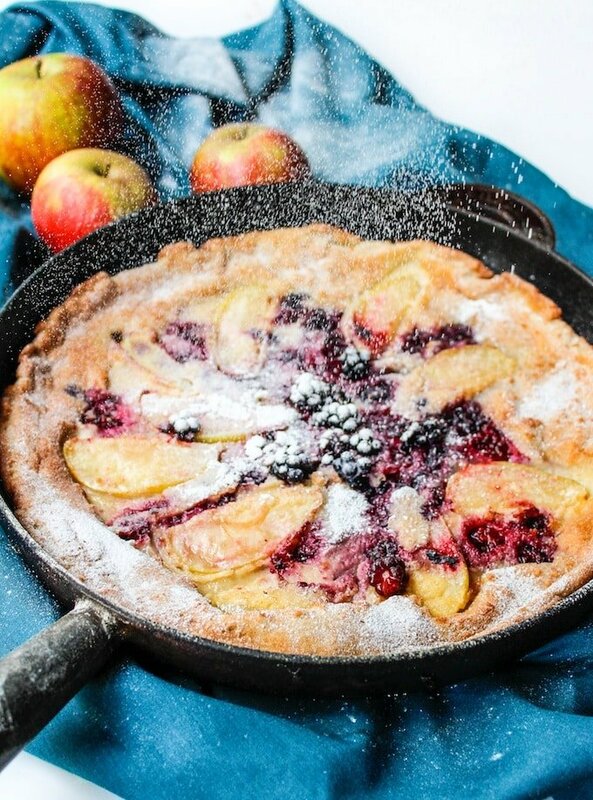 Your fruit dutch baby sounds amazing – I’m really glad you guys enjoyed it so much 🙂 Hope you have a wonderful New Year! 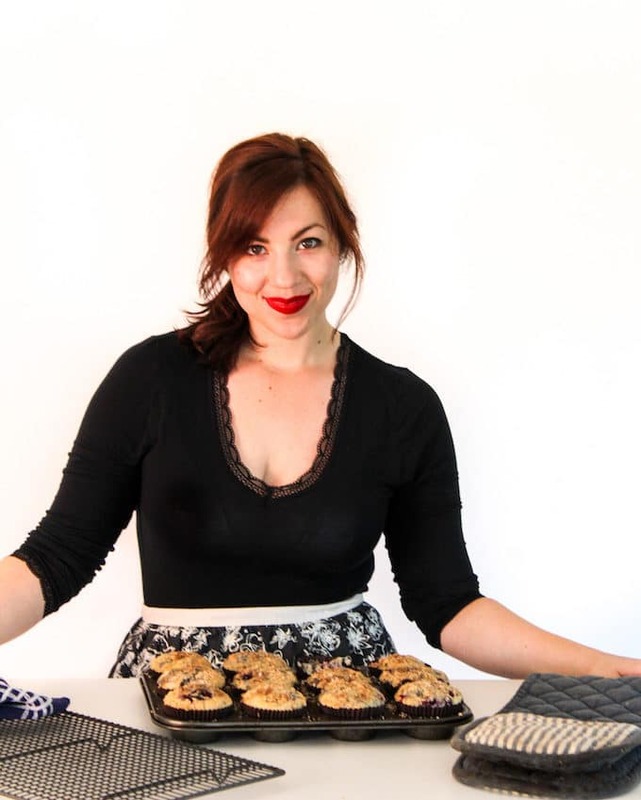 Hey this Blackberry & Apple Paleo is amazing, one big Bravo from me. This recipe is great I hope you continue the good work. I spot this delight in Pinterest and I just want to leave a comment and say – Thank you for the share. This dutch baby recipe is delicious! I’ve made it several times already, and am about to make it again this morning! That’s so great! So happy you like it! Thanks for coming back to leave a comment! I cannot tell you how HAPPY I am to find this recipe!!! I went gluten free a year ago, and I was just told that I am allergic to rice as well. Unbelievable! But with recipes like this, who cares?? I LOVE coconut and tapioca, and almond is good too, but I just don’t see many recipes with them. I am definitely going to try this this weekend. Mouth watering…! THANK YOU, THANK YOU!!! I admit, I was skeptical. But I did try this with reg. Flour, used sour cream,&yogurt. Used blueberry. My kids loved it. Filled them up. I will be doing this again. Glad you liked it! Thanks for sharing your adaptions too! It’s always helpful to see what kind of changes to the recipe works! What can I use instead of tapioca flour (which I don’t have ). This looks yummy! I use corn starch and tapioca starch interchangeably is smaller quantities so I’m pretty sure that it would work in this case too. Hope you like it! I really loved this dish. Followed the exact recipe. I found every ingredient I needed on Amazon Prime Pantry. I topped it off with coconut agave. Delicious! What’s a good substitute for the almond flour for those who are nut-free and grain free? I have tigernut and cassava flour, would either of those work 1 for 1? I’ve got very little experience with wither flour to be honest, but my best guess would be tigernut. Most of the time when I come across recipes with tigernut it seems as if it is just replacing what would have previously been almond flour. I hope that helps! Do you know how I could make this in 9×13 casserole size instead? I have a group of 20 people I need to feed and want to do four casserole pans instead of a ton of cast iron skillets. Thank you so much for this delicious, easy recipe! I just made it and used pears instead (and omitted the cinnamon and added a 1/4 tsp of baking powder) and it turned out amazing! The gluten free dutch baby recipe I normally use calls for room temperature eggs, which isn’t great when you just have a bit of time, so I was really glad to find your recipe that doesn’t call for room temperature eggs. Turned out wonderfully! I can’t wait to try out all sorts of fruit options! I bet it tastes lovely with the pears! I’ll have to try than next since they’re everywhere right now. Thanks for coming back to leave a comment! Just made this….WINNER WINNER and I always love breaking out my cast iron skillet! So glad you liked it! You can never go wrong adding more blackberries in my book! I had some apples from my neighbor’s tree and a bunch of blackberries that needed eating. I made your recipe for brunch today. My family devoured it!! Even those who are skeptics of gluten free cooking. I wish I could post a picture. I don’t have an iron skillet so I used a round stainless steel pan. I blended ingredients in blender. I used Olive Oil instead of Coconut Oil and organic sugar instead of coconut sugar since my husband doesn’t like coconut. He didn’t notice the coconut milk. I cooked up some sausage patties to go with it. I will definitely make another batch of this for breakfast, school lunches or dinner. Thank you very much Sarah!! Bravo! I saw this requires coconut sugar, almond flour, and tapioca flour. Can this be substituted with just regular sugar and flour, or would I ruin the recipe this way? I’ve just got some apples and blackberries that are going to go bad and this sounds like a perfect way to use up all my ingredients! Hi Lauren! You can definitely use coconut sugar in place of regular sugar, but as far the flour goes I’m not sure. If I were doing it, I would use 1 cup all purpose flour in place of the almond and tapioca and then do everything else the same. 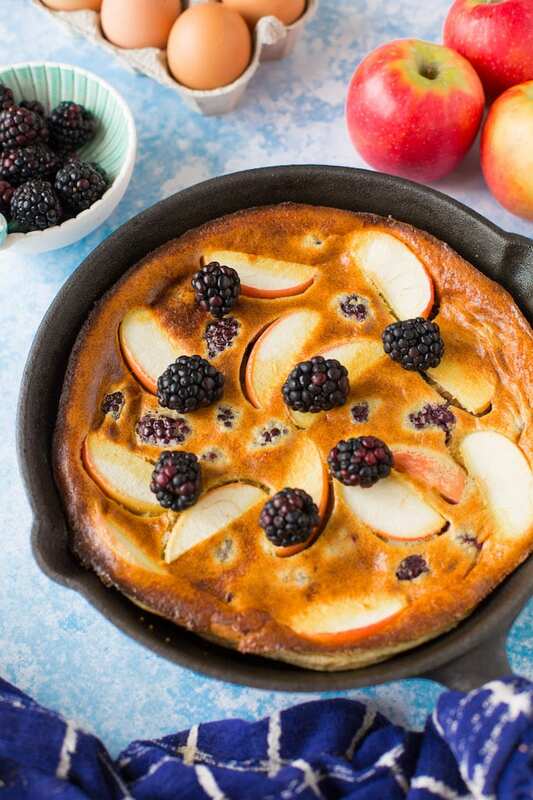 If you want to play it safe thought I might just recommend going with a dutch baby recipe like this one that doesn’t use any expensive flours http://allrecipes.com/recipe/23898/dutch-babies-ii/ You could always add your apple and blackberries to that one too and I’m sure it would still come out great! I used raw honey instead of the coconut sugar. Oh my goodness this dish was delicious! My bestie and I made this for Galentine’s Day brunch this weekend, and we both LOVED it! Thank you for the recipe, I feel like this one will be made over and over again in my house! Happy belated Galentine’s! I’m so glad you guys liked it! This looks so pretty – and tasty! Pinning to save it for later 😀 Can’t wait to give it a try! LOVE that there is only a tablespoon of added sugar. Thanks, Sagan! You’ll love it! What an excellent way to start your day! This looks delicious! Thanks, Jessy! Mornings that involve dutch baby’s are always amazing! You don’t know how delighted I am to find this because recently we have been trying to switch to a more paleo-friendly diet! What a delicious perfect-fall dessert! Oh yay! I’m glad I made something you could enjoy! You’ll love this! This looks absolutely incredible and knowing the fruit is fresh picked makes it irresistible. Oh and your photos are stunning! Thanks, Elle! I think having the fresh homegrown fruit makes me love it even more too! 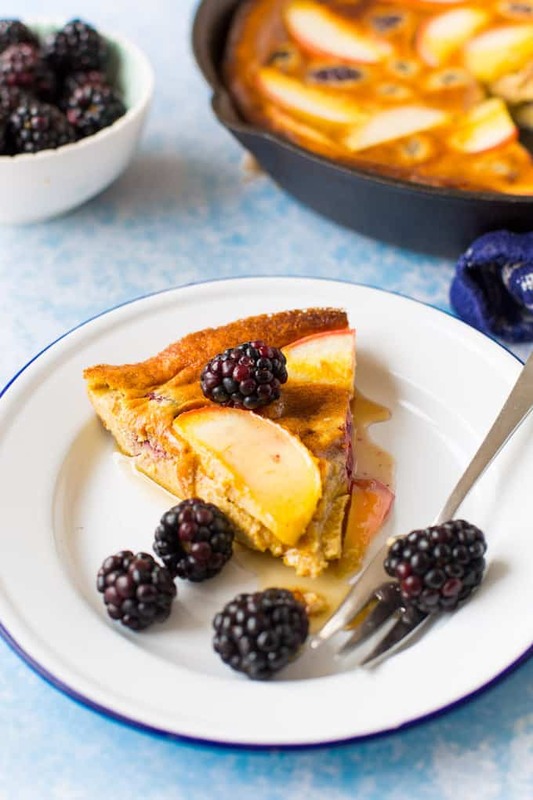 You’re so lucky you have such direct access to these beautiful fruits, they look amazing in this dutch baby. I have to admit I’ve never made a dutch baby pancake before, but this looks so good and definitely would be a welcome sight on my breakfast plate! Hey Gabriel – I know! The best part about the fruit in our garden is that we do absolutely nothing to the plants, but they still produce such amazing fruit. You should definitely try making a dutch baby – they are so easy and soo so satisfying! I am exactly the same with spiders. They scare the crap out of me!!! If I see one in the house and can’t get it before it disappears I can’t stop looking for it and feel antsy in the room until it’s 100% out of the room!!! But homegrown blackberries are divine, so maybe… maybe I could cope. This looks absolutely fabulous! Oh my gosh, I know what you mean! I cannot rest until I know any near by spiders have been evacuated from the house. #cannotdeal Thanks, Annie! These pictures are absolutely gorgeous!!! Love the combo of apples + blackberry. I bet this is delicious! Oh, this looks amazing! Baked apples and blackberries are the best! I’ll have to give this a try! Thanks, Alexis! I hope you love it!